India is challenged by the nexus of environmental degradation and economic growth amidst the paradoxical coexistence of poverty and affluence in their multifarious dimensions. These challenges are directly linked with the conservation and maintenance of the life supporting systems such as land, water, air, and biological diversity. The major causes of environmental degradation are population growth, industrialisation, changes in consumption patterns, and poverty threatening the dynamic equilibrium that could exist between people and ecosystems. In an effort to address these issues, environmental education for sustainable development (EESD) is emerging as an important approach to encourage students to conserve and protect the natural environment in their schools and in their neighbourhoods. 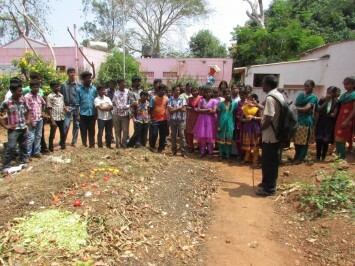 The main Objectives of this research were to foster the acquisition and transfer of the necessary knowledge, skills, attitudes and behaviour with reference to the protection of the environment and sustainable development in selected high schools in the union territory of Puducherry region and Cuddalore district of Tamil Nadu. We have chosen urban schools from urban areas are more vulnerable to environmental impacts. The four schools were selected to represent the diversity of high schools and students in Puducherry and Tamil Nadu regions. A total of 240 students were selected from four schools, of which 60 students from each four school were selected based on their interest, motivation and commitment. The selected students were divided into two groups of which thirty students were in experimental and remaining thirty kept in control groups for each school. The experimental group students were implemented with an innovative curriculum on environmental education for sustainable development (EESD). There was a significant statistical difference between the overall pre and post test impacts on the level of environmental knowledge, behaviour, attitudes, and skills of the students from both the groups. In the post test result, the experimental group students scored significantly higher knowledge, attitudes, skills and behaviour on air, water, biodiversity conservation and solid waste management than the students who were exposed to the traditional teaching methods with existing curriculum. It may be concluded that the active teaching learning approach is more effective in facilitating environmental education for sustainable development among school children. India is challenged by the nexus of environmental degradation and economic growth amidst the paradoxical coexistence of poverty and affluence in their multifarious dimensions. These challenges are directly linked with the conservation and maintenance of the life supporting systems such as land, water, air, and biological diversity. The ultimate drivers of environmental degradation are population growth, inappropriate technology and consumption choices, and poverty, leading to changes in relations between people and ecosystems, and development activities such as intensive agriculture, polluting industry, and unplanned urbanisation. For addressing the various environmental problems, Environmental Education for Sustainable Development (EESD) is emerging as an essential tool to change student’s commitment, motivation, stewardship, behaviour and attitudes (UNESCO, 2011). To achieve the goals EESD, the active teaching learning approach is widely recommended by several earlier workers who have found that traditional class room lecture based teaching learning approach have limited effectiveness in helping students to retain information, become self-learners, and develop skills in transferring knowledge and solving problems (McLeish 1968; Davis and Alexander 1977; Saunders 1980; Bonwell and Eison 1991; Gardiner 1994; Fink 2003). Further research demonstrated that when students are involved in active teaching learning process, retention of knowledge is significantly increased (Mackenzie and White., 1982; Grant 1997; Nundy, 1999; Cooper et al. 2000), there is enhanced motivation and higher-order learning (Kern and Carpenter., 1986) and development of practical skills (Kent et al, 1997). Learning through experiences has both process and outcome dimensions, with basic content mastery integrated with opportunities to manage complex projects, apply critical thinking, and develop skills in inquiry that have applications beyond the classroom (Fink 2003). For instance, experiential learning in the school gardens can inculcate scientific outlook food behaviour, positive social and environmental attitudes/behaviours (Dorothy Blair, 2009). Place-based approaches in environmental education are valuable for several reasons. These approaches provide students with opportunities for learning in real situations (Sarkar & Frazier, 2008), connect new learning to students’ prior experiences (Smith, 2002), facilitate potential academic outcomes leading to self-perceptions (Skinner et al, 2012), provide significant connections between schools and the local communities /environment (Woodhouse & Knapp, 2000; Sobel, 2004), and actively engage students in making sense of what they are learning (Sobel, 2004). Field based education is one component of active environmental education. There is a strong agreement that fieldwork is advantageous for learning in the biosciences (Davenport, 1998; Baggott and Rayne., 2007), and nature studies has traditionally had strong connections with fieldwork, dating back to early naturalists such as Gilbert White, Charles Darwin and Wallace (Davenport, 1998; Baggott and Rayne., 2007). However, in practice, field work in the environmental studies at school level is limited or negligible and there is a very little research on the experiential learning at school level in India. Active teaching learning methods involve students in the learning process such as discussions, writing, asking and answering questions and engaging in their own learning. These activities in turn require students to use critical thinking skills such as analysis and evaluation (TIEE, 2006). Teachers use a variety of approaches in student-active classrooms such as cooperative group work, debate and discussion, and open-ended problem solving. Formative evaluation of ongoing evaluation of a course is a critical aspect of student-active teaching because this process helps teachers be more reflective and effective teachers (TIEE, 2006). Constructivist theory frames learning as an active, continuous process whereby learners take information from the environment and construct personal interpretations and meaning based on prior knowledge and experience (Driver and Bell., 1986, Roth, 1990). Moreover, learners construct knowledge by physically and mentally acting on objects or phenomena in the environment (Piaget, 1970) and through social interactions with members of the community (Vygotsky, 1986). Thus, students learning about environment are in part influenced by the personal ideas and understandings they construct about the world. Teaching students how to learn and how to develop their sense of curiosity are goals of educators in general and science teachers in particular. For instance, Biology, concerned with the wonders of life, offers many fascinating natural phenomena that provoke thought and stimulate curiosity. Students are likely to understand the natural world if they work directly with natural phenomena, using their senses to observe and using instruments to extend the power of their senses (National Science Board, 1991). Novak (1964) suggested that inquiry involves human beings in the struggle for reasonable explanations of phenomena about which they are curious. In order to satisfy curiosity, inquiry should involve activity and skills, but should focus on the active search for knowledge and understanding of unusual elements in the environment (Maw and Maw, 1965; Haury, 1993). Experiential learning theory (Kolb, 1984) suggests that students learn more effectively by ‘doing’ than by ‘listening’ (active rather than passive rote learning) and this is a major strength of learning in the field where students are involved in environmental projects, data collection and analysis. In addition to the direct educational benefits, fieldwork has been reported to increase confidence and motivation (Smith, 2004; Boyle et al, 2007). The environmental philosopher John Muir (1901) emphasized that the People will act on behalf of the natural world if they have exposure to it, therefore knowledge about it. It is now well established that knowledge about the natural world will influence attitudes regarding the natural world, which will in turn impact one’s actions on behalf of the natural world (Goralnik and Nelson, 2011). The current research is focused on the effectiveness of active teaching learning strategy to address the environmental issues. This will add to the existing body of literature with important insights regarding how best to develop programs that promote pro-environmental behaviour and sensitize the student community about the various complex local environmental issues. Puducherry and Cuddalore towns are facing serious environmental problems due to rapid urbanisation/industrial growth and the consequent increase in the number of vehicles. Students are major agents for creating environmental awareness as they are future responsible citizens. Therefore, this study was conducted on the middle school students (7th to 9th standards – age group ranging between 13 and 15 years from Puducherry and Cuddalore regions, South India. The sample size consisted of 240 students with the same levels of attitude, behaviour and skills related to environmental issues randomly selected from four representative middle and high schools from urban areas of Puducherry and Cuddalore regions (Table 1). The urban schools were selected since urban areas are more exposed to human impacts and more vulnerable to environmental degradation than the rural areas. The student’s age group ranged between 12 and 14 years, since they belong to 7th to 9th standards that have more time to spare for co/extra curricular activities both with in and outside class hours. The dedication, interest and motivation levels aof the concerned teachers, school principals and correspondent were used as the criteria for selecting the schools. 60 students were randomly selected from each school and were divided into two groups in which 30 students were kept as experimental group; another 30 students from the same school were treated as control group. The experimental group students were exposed to active EESD program. 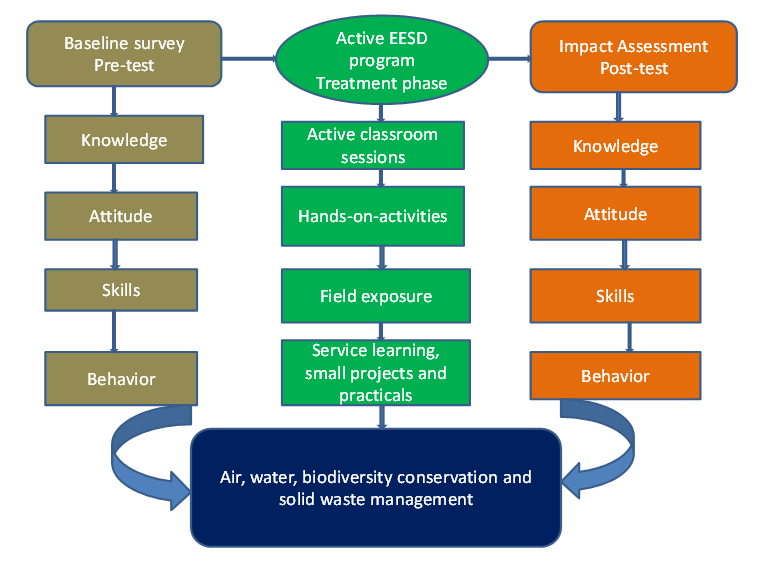 The active EESD program was conducted during July 2009 to April 2010; the post test was conducted immediately after the EESD program. A schematic diagram of pre and post test design for EESD modules is shown in Figure 2. Students from both control and experimental groups were pre tested before the implementation of the EESD program to evaluate their previous knowledge, skills, behaviour, and attitudes towards various environmental issues -mainly focussing on air, water quality, biodiversity conservation and solid waste management. The experimental group was then imparted with active EESD program; this included various teaching learning strategies such as interactive classroom sessions, field exposures, lab experiments, hands-on exercises, small group projects and service learning opportunities. At the end of the program after one year, both experimental and control groups underwent the post-test using similar variables that were used for the pre-test. In the present study, Questions were prepared with slight modifications of items from previous questionnaires used for similar enquiries (Thomson and Hoffman, 2002, Kostova, 2008, Hagenbuch et. al., 2009). The questions are grouped into four environmental categories- on air water quality, biodiversity conservation and solid waste management (perceived as the most serious issues at the local level) in order to assess the student’s knowledge, attitudes, behaviour and skills towards these categories. The major objectives of the active EESD program was to foster the acquisition and transfer of knowledge, behaviour, attitudes and skills concerning the environment and its problems as well as to monitor their efficacy on the students. 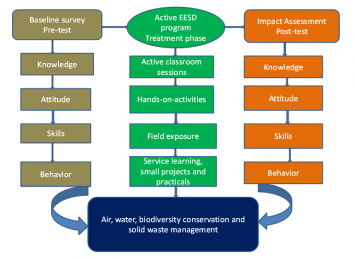 The active EESD program on air/ water quality, biodiversity conservation and solid waste management is composed of three constructs – didactic, instrumental and conceptual (Belgrade 1975, Kostova 2003, UNESCO 2005, CEE and CSE). Environmental education is not only education to inspire environmental stewardship and responsible citizenship, but also education to protect today’s “de-natured” and increasingly unhealthy society. This shift in discourse is also bound to generate broader public interest and perhaps motivate local, state, and national policy makers to advocate for the integration of EE within the school curriculum (edible schoolyards, place-based education, walk-to-school initiatives), as well as help more informal EE programs (e.g., after-school activities, natural science programs, and experiential-based programs) that become more widely accepted (Strife, 2010). The didactic construct ensures contemporary educational process in which all achievements of pedagogy and psychology are put into practice. Instrumental construct include development of students as total personality and use of arts as pedagogical tools in environmental issues. The conceptual construct comprises the environmental issues, concepts and reveals them from different perspective- cognitive, value and action. These three constructs of the innovative model of EE proposed by Kostova (2003) was taken together to provide the possibilities for closer interaction of psychology and pedagogy with environmental issues on the basis of continuous research and improvement. 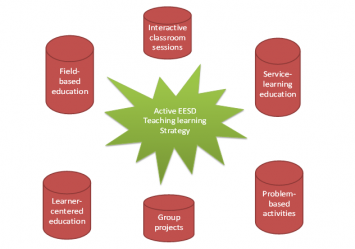 Through the innovative model of EESD, a system of approaches was put into practice. To prepare this EESD module, basic EE objectives as prescribed by NCERT (2005) were also considered. A variety of instructional strategies and experiential approaches were used for experimental group. These includes classroom sessions, field trips, nature walks, practical, creative drama and experiences and small ecological and environmental projects. A variety of instructional strategies were also adapted that included-documentary film shows, case studies, classroom debates, group presentations, simulation games and drama as suggested by Heyman (1982), Gifford (2002) Proulx, (2004). Documentary film is a multimodal, multisensual, and universal medium that has the potential to reach and influence a wide range of people regarding environmental issues (Bahk, 2010). The research conducted by Bahk (2010) found that participants in the experimental group became more favourable toward the preservation of forests than did those in the control group. Students were encouraged to take photographs of nature and wildlife instead of collection of samples/live specimens so that they could inculcate a culture of conservation into their day today interactions with nature and wildlife. This reduced the mortality of rare plants and animals, and thereby conserving campus/neighbourhood biodiversity (Plants, butterflies, dragonflies, birds and insects). Afterwards, Students were encouraged to express in writing why they took these pictures and what they intended to show through the power point presentations to all other fellow school students. Games related to various environmental issues, such as human population problems, water pollution, air pollution, solid waste issues, biodiversity loss, urbanization, have been evolved based on the suggestions of several earlier workers (Jacobson et. al., 2007). A study conducted by Mackenzie and Edwards (2013) emphasised that play based education must be integrated into environmental education. The use of drama and role play, particularly with middle school students aged 12 to 14, were used as a strategy to develop students’ understanding of basic environmental and ecological concepts (Bailey and Watson, 1998; Gifford, 2002; Whitty, 2003; 2006; Stone, 2007). Different types of drama and role plays were used to raise various concepts of environmental awareness such conservation of wild animals’ birds and natural resources. After the end of each activity, students were asked to write down their ideas expressing their perceptions, feelings and experiences about their environment. Hands-On Learning is an instructional technique where students manipulate the laboratory materials to help develop an understanding of the concepts related to environmental problems. Water quality assessment program was carried out with experimental group students under the closer supervision and guidance of the researcher. The first step was to involve students in water quality monitoring program conducted in school as well as school neighborhoods. Water samples were collected for this purpose (Tap water ,bore well and surface water) .The ground water/bore well water samples ranging from 20 to 25 m. depth as well as surface water from a tank or pond for drinking purposes were used as the sampling points. The water samples in triplicate were meticulously collected in laboratory glassware, rinsed with distilled water and washed with the water to be tested. Water testing was done with portable water test kit JAL-TARA, developed by Development Alternatives (DA), New Delhi. Students have analyzed simple water quality parameters such as pH, Fluoride, Nitrate, Iron, Hardness, Chlorine, Ammonia and coli form. Students also interacted with local people to convey the findings. There were also discussions on the need to ensure good quality supply of water and the water associated health problems. Air quality assessment program was conducted with experimental group students. The sites monitored were the major traffic junctions and highways, adjacent to schools in Puducherry and Cuddalore towns. Sulphur dioxide, Oxides of Nitrogen and Suspended Particulate matter were analysed using portable air quality testing kit PAVAN-TARA which is a low volume air sampler developed by Development Alternatives, New Delhi specially designed for school children the concentration of air pollutants were assessed using standard colour charts. The experimental group students were involved in campus waste auditing activities such as characterization, quantification, as well as recycling and reusing techniques (Image 1). Various organic wastes such as vegetable, leaf litter, papers and food waste generated in school were converted as organic manure, for school vegetable gardens maintained by students. Since field work as a pedagogical method have been shown to benefit student’s cognitive skills and motor coordination and facilitate interest , enhance knowledge acquisition and understanding by situating learning in context and providing opportunities to transfer and apply prior knowledge (Martensson et.al., 1997, Lieberman and Hoody ,1998, Fjortoft, 2001, Dillon et al, 2006, Uitto et al, 2006, Hamilton and Ekeke, 2007, Magntorn and Hellden, 2007; Louis & Richard Jordan, 2012), this constituted an important part of the proposed learning activities in this study. Environmental education demonstrates the powerful effect that environment based education and exposure to nature has on student’s cognitive, emotional, physical, and psychological development (Susan, 2010). Hence this EESD program was planned and implemented to investigate how place based education, promotes student test scores and overall motivation for learning about environments. Visit to places of environmental concerns provided best opportunities to the learners as a means of observing and experiencing the real environment. It has enough scope for building environmental awareness, stimulating participation and developing investigative skills in learners. The experimental group students visited Ousudu lake bird sanctuary, located 10 kms away from Puducherry bus stand. In order to sensitize the importance of biodiversity and its assessments, it was important for the students in our field-based biodiversity course not only to learn about the plants and animals associated with Ousudu lake (largest fresh water wetland in Puducherry region) but also to understand how this biodiversity can be assessed in the field. With basic field equipments such as forceps, nets, buckets, shovels, sieves, binocular, microscope and collection jars, the students surveyed the diversity of riparian vegetations, hydrophytes, other plants and animals living in the water and land. Different sampling strategies, such as rapid biodiversity inventories for reptiles for butterfly survey random supervised walks and opportunistic observations mostly during the morning (08:00–11:00 hr) and in the evening (16:00–19:00 hr) were carried out by the students, the species were then identified with standard references (Gunathilagaraj et al, 1998, Kunte 2000 and Kehimkar, 2008). These timings were found to be suitable since the maximum butterfly activity happened during these times. Butterflies and dragonflies were utilized to more systematically cover the area sampled, and for this, students used a tape measure and poles to delineate the sampling plot for plant and animal species. Thus the students learnt the diversity and richness of organisms in their local environment. The experimental group students were taken to the local vermi-compost yard (funded by Asia URBS project maintained by women self help group) located in Uppalam, Puducherry (2Kms from the Puducherry bus stand). Students were exposed to various processes of waste collection, segregation, initial microbial composting and vermi-composting and its utilization. Students were also provided with knowledge on various activities of earthworms in healthy soil formation and their role on sustainable farming. This has encouraged the students to take up composting at the school level. The experimental group students paid a visit to handmade paper factory run by Sri Aurobindo Ashram, Puducherry town where students learnt innovative paper manufacturing from various environmental friendly raw materials such as used second grade papers, cloths and plant fibers. After this field visit, students could make various goods from paper wastes, collected from the school. Visits to natural areas were organized for experimental group students to discover nature through their senses. During such visits, various games were also conducted that involve touching and smelling of various plant species, hearing the sounds and observing various birds and insects in the botanical garden (CLEAN India, 2005). The students took samples (when appropriate) and recorded their experiences by means of drawings, sound recordings and writings. Negative attributes (e.g. littering, injuring fauna, plugging flora) had been discussed before the natural visits in the class room as well as in the field. These activities helped students to value natural areas, such as the ones visited and develop positive attitudes regarding their protection. In this study, standard statistical techniques such as mean (X), standard deviation (Std. DEV) and t-test were used in the analysis of the data. P value was held as 0.05. Significance level was decided by taking p values into consideration. The statistical analysis was done by means of SPSS 16.0 statistical package programme for windows. Paired-sample two-tailed t-tests were used to compare pre- test and post- test means for each question on the content to test the students knowledge, skills, attitudes, behaviour on air/ water quality, biodiversity conservation and solid waste management. Mean pre- and post- test scores were evaluated for the student’s assessment attributes such as knowledge, attitude, behaviour and skill. Mean score was calculated from Likert-style scale responses by adding scale responses into an index for environmental knowledge, attitude, behaviour and skills and then calculating the mean as suggested by Hagenbuch (2009). The environmental knowledge test was administrated on a total number of 240 students in a middle school level. In the first place, the item and test statistics of the achievement test were computed for reliability and validity. The test for the reliability of the knowledge was performed using the methods prescribed by Tekin, (1996) and Yılmaz, (1998). The reliability value of the test was found as r = 0.84. The attitude scale test was applied to measure the attitudes of the students towards the environment in the study. The attitude scale test is a five-point likert type scale (which was used to differentiate orientations from 1 as low and 5 as high) reliability and validity of which have been made by t-test, including 26 items of questions regarding environmental studies that measure students’ attitudes towards the environment. The reliability value of the attitude scale test was found as r = 0.86 and the Cronbach’s Alpha value was found as α = 0.86. 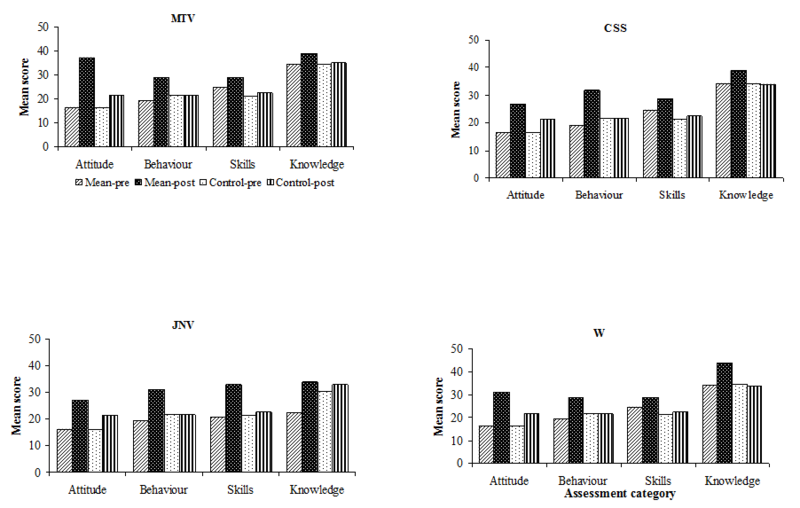 There was a significant statistical difference between the pre and post test on the student’s overall environmental knowledge, behaviour, attitude, and skills level who had been exposed to active EESD teaching strategies and the students who have been educated by the traditional instructional methods. The former (EESD group) have gained more basic conceptual knowledge, attitudes and skills on air/ water quality, biodiversity conservation and solid waste management than the students who have been educated by the traditional teaching methods with existing curriculum. The results are presented and discussed in the subsequent sections. The post test analysis revealed that there was a significant difference on experimental student’s knowledge on air quality studies such as the basic concepts of air pollution; major air pollutants, its sources and impacts plants, animals, ecosystems and materials and control measures. However, in control group students, there was no significant difference in between pre and post test analysis (CSS-t = 11.34, p <0.05; JNV-t = 5.1, p< 0.05; MTV -t = 12.34, p< 0.05; VV-t =4.6, p< 0.05; CON-t=1.4, p <0.05). There was a significant improvement in the analytical skills among experimental group students in comparison to the control group on handling of air quality monitoring kits and monitoring physical chemical concentration in sampled air such as nitrogen dioxide NO2, sulphur dioxide SO2 and suspended particulate matter (SPM) from various places ranging from school campuses, highways and nearby industrial places. (CSS-t = 15.1, p <0.05; JNV-t = 8.16, p< 0.05; MTV -t = 12.1, p< 0.05; VV-t =3.6, p< 0.05; CON-t=1.8, p <0.05) The average post-attitude score of the students in the experimental group were significantly greater – at 0.05 level (CSS-t = 11.34, p <0.05; JNV-t = 6.7, p< 0.05; MTV -t = 12.34, p< 0.05; VV-t =4.6, p< 0.05; CON-t=2.4, p <0.05). Thus, the active EESD teaching strategy has enabled the students to gain positive attitudes towards the air quality studies; anthropogenic sources of air pollution, impacts of air pollution on plants/animals, human health, and environment and the interdependence of this issue with a variety of environmental aspects. Some local level actions on the ground such as planting trees within the school campus, and house backyards to protection of local air quality were also noticed. The behavioural attitudes towards control and protection of air quality at school level as well as at the local level were significantly higher in experimental group students (CSS-t = 7.9, p <0.05; JNV-t = 6.6, p< 0.05; MTV -t = 13, p< 0.05; VV-t =6.6, p< 0.05; CON-t=1, p <0.05) while no behavioural changes were observed in the control group (Figure 3,4,5 and 6). There was a significant increase in student’s knowledge, skills, attitudes and behaviours related to water quality issues among the members of the experimental group (Figure 7, 8, 9, and 10). There was a significant increase (P>0.05 level) on the knowledge related to the fundamental concepts of water quality studies among the experimental group students. These include definition of water pollution, global distribution of water on earth, various water pollution sources and control and prevention methods besides conservation of water at local level (CSS -t = 6.7, p <0.05; JNV -t=5.0, p <0.05; MTV -t=6.73, p <0.05; VV -t=4.0, p <0.05; CON-t=1.1, p <0.05). The post test results revealed that student’s skills have improved in manipulating the water quality assessment instruments and monitoring the drinking water quality from the school as well as local residential areas (CSS-t = 12.122, p< 0.05; JNV- t = 11.99, p< 0.05; MTV-t = 10.10, p< 0.05; VV-t = 6.4, p< 0.05 CON-t=0.8, p <0.05). The attitudes towards conserving and protecting local drinking water sources were significantly higher at P>0.05 level in experimental group than the control group (CSS-t = 6.70, p < 0.05; JNV-t = 5.4, p< 0.05; MTV-t = 4.7, p< 0.005; VV-t = 3.7, p< 0.05 CON-t=1.6, p <0.05). There was a significant difference between pre and post test results for experimental group students on behavioural changes on water quality issues related to water conservation (CSS-t = 12.10, p< 0.05; JNV-t = 4.6, p< 0.005; MTV -t = 6.4, p< 0.05; VV-t =2.5, p< 0.05; CON-t=1.4, p <0.05). Significantly higher values were reported for the experimental group students (CSS-t = 12.2, p <0.05; JNV-t = 8.6, p< 0.05; MTV -t = 8.1, p< 0.05; VV-t =5.6, p< 0.05; CON-t=2.64, p <0.05) in terms of biodiversity knowledge; defining the term biodiversity, levels of biodiversity, importance of biodiversity, causes of biodiversity loss and conservation of biological diversity than the control group students. Biodiversity assessment skills, such as identifying plants and animal species and identifying human threats to biodiversity and conservation strategies , various biodiversity process skills such as oral communication about biological resources, written communication about biodiversity issues, identifying conservation problems, gathering credible information to support a project, sorting and filtering diverse sources of information, applying critical thinking to solve biodiversity problems, collecting data and managing information and working collaboratively with and in a group besides attitudinal changes towards the conservation and protection of local biodiversity and its protection /conservation significantly increased among experimental group students (CSS-t = 10.9, p <0.05; JNV-t = 16.7, p< 0.05; MTV -t = 4, p< 0.05; VV-t =3.2, p< 0.05; CON-t=1, p <0.005). Behavioural changes in conservation and protection of local biodiversity were significantly increased in the case of the experimental group (CSS-t = 4.9, p <0.05; JNV-t = 14.2, p< 0.05; MTV -t = 7.1, p< 0.05; VV-t =6.8, p< 0.05; CON-t=1.8, p <0.05) (Figure 11, 12, 13 and 14). The post-test results for the experimental group revealed that there was a significant increase in student’s knowledge on solid waste issues such as the problems associated with wastes, classification of waste and its characterization, various management strategies which includes the 4R concept; refuse, reduce, reuse, recycle, microbial and vermi-compost (CSS-t = 12.3, p <0.005; JNV-t = 10.7, p< 0.005; MTV -t = 11.1, p< 0.005; VV-t =9.8, p< 0.005; CON-t=2.8, p <0.005) while for the control group , there was not much difference in post test results. The acquired skills of the students such as ability to classify, segregate and , quantify waste and adopt sustainable waste management practices had improved for experimental group students than that for the control group (CSS-t = 4.9, p <0.005; JNV-t = 14.2, p< 0.005; MTV -t = 7.1, p< 0.005; VV-t =6.8, p< 0.005; CON-t=1.8, p <0.005). The attitudes towards the segregation and various solid waste management practices by students at school level as well as household level had significantly improved in the case of experimental group students (CSS-t = 8.9, p <0.005; JNV-t = 13.2, p< 0.005; MTV -t = 8.8, p< 0.005; VV-t =5.3, p< 0.005; CON-t=1.7, p <0.005) whereas in control group, there was not much difference between pre and post test (Figure 15, 16, 17 and 18). The active EESD approach based Environmental education activity in the field had enhanced the student’s knowledge on environmental issues such as air, water, solid waste management and biodiversity among the selected experimental group students. This is in agreement with the earlier findings (Leeming 1993, Zelezny 1999, Humston and Barney 2007, Anderson et al. 2007, Louis & Richard Jordan, 2012). Fieldwork, one of the important components of the active EESD program was extensively used in this study. The students participated in the active EESD program have altered their attitudes and behaviour by visiting bird sanctuaries, protecting the birds nest in the nearby lake ecosystem, as well as communicating the threats to the biodiversity to local community, friends and with parents. As an outcome of the extensive field study, students’ knowledge on biodiversity, skills and attitude to conservation of local biodiversity were significantly improved. For example students were able to describe local and scientific names of the migratory birds, their ecological roles in maintaining healthy fresh water/wetland ecosystems, describe the names of the rare, vulnerable and endangered plants and animal species of the local wetlands. Students also assessed the quality of air, water, SWM and biodiversity by extensive hands on exercises during the field trips. The information gathered through field studies were shared with local community and school administration to take necessary steps. As pointed out by several earlier workers, various environment related activities outside the classroom can encourage students learning and beliefs about their surrounding environment and enhance their knowledge (Uitto et al, 2006, Moore, et.al, 2011, Boyesa and Stanisstreet, 2012). Therefore field trips in the natural areas are an important component for student’s personal development and sustainable future. In the present study the student’s local environments such as school gardens, lakes, bird sanctuaries, botanical gardens and forests were the sites for the field trips as an integral component of the EESD program. Different sources of information encourage positive attitudes towards environment that could lead to particular environmental action – cognition, emotions and feelings as reported by Julie and Pooley (2000), Moira and Connor (2000), and CBD, (2012). Studies related to student’s attitudes assessment that are made through direct experiences in the natural settings are also seen as better predictors of positive behaviour (Millar and Millar, 1996). In the present study, various experiences in the field based education have positively enhanced the student’s behaviours towards conservation and protection of nature in terms of segregation of waste, rain water harvesting and biodiversity conservation. The environmentally responsible behaviours are associated with personal growth- including feelings of environmental sensitivity, empowerment, and ownership for nature (Hungerford & Volk, 1990) that can be enhanced by EESD as shown in the present study. The combination of interactive and experiential approach for environmental education has significantly changed across a wide range of disciplines in education and psychology (Kolb and Kolb, 2006). An increasing empirical research on environmental education (Dyer and Schumann, 1993; Stienborg and Zaldivar, 1996; Gopinah and Sawyer, 1999; Cleave and Morgan, 2002; McGlinn, 2003) indicates the effectiveness of experiential learning in the natural areas enhancing students’ meta-cognitive abilities, their capacity to apply newly acquired skills and knowledge to real-life situations, and the ability to become self-directed learners (Kolb and Kolb, 2006). In the present study, students had involved in various experiential activities like water quality assessment in the residential areas, air quality assessment in the major traffic junctions, solid waste surveys and biodiversity assessment in the schools, lakes, ponds and in local villages. Such extensive learning activities had improved students ability to understand the real life situations in the local context. Skills are important determinants of environmental conservation and protection. In the present study, the students were facilitated with various skill building opportunities such as water quality assessment, air quality monitoring, solid waste management practices and biodiversity inventories in the lakes, ponds and in the botanical gardens. These acquired skills have led to the adoption of conservation and protection strategies at local level such as documentation of local biodiversity, implementations of solid waste management system within school premises and the monitoring of physical, chemical status of air and water quality for community information. Thus, EESD program provided students with a variety of transferable skills such as basic classification skills. In addition, students have built their collaborative problem-solving skills. The EESD program has given the opportunity for cooperative learning by which students can increase their group cooperation skills, data sharing and communication skills. As an outcome of the active EESD program, various environment conservation and protection initiatives started within the school premises, besides rain water harvesting structures in some schools in Puducherry and Cuddalore with the help of a local NGO- FERAL and school administration to conserve the water. Due to the improved rainwater harvesting strategies, the selected schools were able to save tap water to a considerable extent during 2009 to 2010 (42,600 L /year) for Puducherry schools and 28,000 L/year for Cuddalore schools) the average waste paper generated from the selected schools were 14-19 kg per day (for each school). Recycling of manure from the organic waste generated from school, converted into natural compost and vermicompost by the students, have improved soil quality and plant productivity in the school gardens that reduced the dumping of bio-degradable organic wastes in the campus leading to foul smell along with associated health problems and has the additional benefit of using the worm castings for bio-fertilizer in vegetable gardens and medicinal gardens within the school campuses. About 40 percentages of the non biodegradable waste was converted to several useful goods such as pen-holder, caps, paper bags and small tubs that were used in the school. A reduction in paper use will again provide significant savings for the school. The average biodegradable waste produced from the selected schools -60-80 kg per day/school, could be a potential resource for compost and vermicompost. 80 percentages of organic waste generated from schools was converted as microbial compost, around 30-40 percentage of microbial compost was converted as vermicompost. This has largely reduced the cost for application of the chemical fertilizer around Rs 3000/year in the selected schools. Setting up of vegetable garden has contributed the need for meeting a part of the mid day meal cooking needs in schools. Besides, the native vegetable seeds (Solanum melongena, Hibiscus esculentis, Cucurbita maxima, Solanum lycopersicum, and Dolichos lablab) have been distributed to students to encourage organic nutrition gardens at household level. Nearly 50 students, especially those who have backyards and agricultural lands have setup vegetable gardens at their residences due to the EESD program both from Cuddalore and Puducherry. Planting nectar plants such as Stachytarpheta jamaicensis, Leucas aspera, Ixora coccinea, Tridax procumbens, Waltheria indica and Solanum trilobatum within the school premises attracted more butterfly species and other insects that also contributed to the biodiversity wealth of school gardens. Microbial and vermi-compost unit in school campuses as part of the EESD program facilitated the production of bio fertilizer to green gardens in schools. JNV School with APSCC NGO support has initiated sustainable campus programs such as vermi-composting with the substrate of kitchen waste and other organic waste materials, organic kitchen garden, biogas plant, water harvesting system, waste water treatment using aquatic macrophytic plants and suitable plantations these initiatives have reduced the fuel consumption, water usages, economise on vegetable purchase, sustainable usages of water resources. Two communities such as Navarkulam Village near Laws pet Puducherry (located closer to Makkal Thalaivar Vasudeva Subya Government High school, Puducherry) and Sigarathope village in Cuddalore (located closer to Valliammal Vidyalaya Matriculation Higher Secondary school, Cuddalore) were selected for community awareness program by students. As a consequence of the EESD program the two communities started sustainable solid waste management system through which the women’s self help group (SHG) produced compost and vermi-compost. The compost was distributed to each household (2-4 kg/ year) for backyard gardens and also sold for other villagers by whom they are earning Rs 200 per month per household. Through this system around 2 tons of wastes were turned into compost and vermi-compost both in Cuddalore and Puducherry during 2009-2010. The present study demonstrates that the active teaching /learning approach significantly improved knowledge, attitude, skills and knowledge on local environmental issues. This program has connected students with local community to understand the various environmental problems. Students have gained ability to communicate with local people by service learning opportunities that have led to understanding about the interaction of the environmental problem with its community. Students had also improved their thinking, and solved environmental problems at local level and played a key role in sowing the seeds for local sustainable development. In fact, UNESCO, the lead agency for the UN Decade of Education for Sustainable development (2005-2014) is encouraging EESD as it has realised the importance of the concept. India is the only country to have passed one of the landmark judgments passed by the Supreme Court of the country directing all education boards to include environmental education (EE) as part of the formal education system at all levels. Besides the different ministries of the Government of India, a large number of government and non-government organizations are diligently working to promote ESD. Most notable amongst them are Centre for Environment Education (CEE) which is the nodal agency for implementing UNDESD in India; The Energy and Resources Institute (TERI); Bharati Vidya Peeth (BVP); Centre for Science and Environment (CSE); World Wide fund (WWF); National Council for Science Museums (NSCM) and National Council of Education, Research and Training (NCERT). These organizations work with schools, colleges, youth groups on ESD and conduct training programs not just for students but teachers, principals, school administrators and policy makers. However, much remains to be done to redesign the middle school curricula so that EESD can be organically integrated into the core education modules, instead of keeping it as a separate paper or activity. The lessons learnt from the results of the present study may be used for revising the curricula. Active EESD must go beyond teaching about environmental issues. EESD must impart the students with necessary attitudes, behaviour, knowledge and practical skills that will enable them to continue learning after they leave the school, to facilitate sustainable lifestyles. 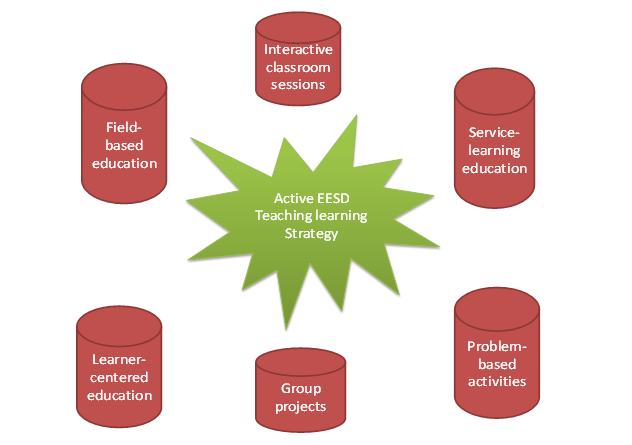 Active EESD is an ongoing process. It should be approached as a series of small steps and expectations should be kept as realistic as possible. Thus, EESD needs to be embedded in the curricula and action so that it continues even when there are staff changes. There must be continuous staff training /refresher programmes on EESD that can be effectively carried out by the State Environmental Education cell, Government of Puducherry. The authors are thanks to the Department of Educational Research and Policy Perspective (DERPP) and the National Council of Educational Research and Training (NCERT), New Delhi, India for fellowship. We thank the officials from Directorate of School Education, Government of Puducherry for their permission to conduct our EESD Research in Schools. Vinayathan, Principal JNV School granted permission and encouraged us to conduct our Research in the school and to interact with students for which we are grateful. We also thank the student volunteers, who helped us in carrying out this study. Gardiner, L. 1994. Redesigning Higher Education: Producing Dramatic Gains in Student Learning. ASHE-ERI Higher Education Report 7.Washington, D.C.: GeorgeWashington University. Davis, R. H., and L. T. Alexander. (1977). The Lecture Method. Guides for the Improvement of Instruction in Higher Education, No. 5. East Lansing, Michigan: Michigan State University. McLeish, J. (1968). The Lecture Method. Cambridge, England: Cambridge Institute of Education. Saunders, P. (1980). The lasting effects of introductory economics courses. Journal of Economic Education 12 (1): 1–14. Fink, 2003. Creating Significant Learning Experiences: An Integrated Approach to Designing College Courses. San Francisco, California: Jossey-Bass. For the 21st Century.” Education Manitoba, Vol 17 n 1; January – February. For the environment? set: Research information for teachers, 1, 4-9. Grant, R. (1997). A claim for the case method in the teaching of geography. Journal of Geography in Higher Education 21 (2): 171–185. Cooper, J. L., J. MacGregor, K. A. Smith, and P. Robinson. (2000). implementing small-group instruction: Insights from successful practitioners. New Directions for Teaching and Learning 81:63–76. Klionsky, D.J. (1998). A cooperative learning approach to teaching introductory biology. Journal of College Science Teaching 27 (5): 334–38. Lord, P (2001) Pupils’ experience and Perspectives of the National Curriculum: Updating the Research Review 2000-2001 Research report. Connell, D.W., Fung, C.N., Minh, T.B., Tanabe, S., Lam, P.K.S., Wong, B.F.S., Lam, M.H.W., Wong, L.C., Wu, R.S.S., Richardson, B.J., (2003). Risk to breeding success of ﬁsh-eating Ardeids due to persistent organic contaminants in Hong Kong: evidence from organochlorine compounds in eggs. Water Research 37, 459e467. Udovic, D., Morris, D., Dickman, A., Postlethwait, J., and Wetherwax, P. (2002). Workshop biology: demonstrating the effectiveness of active learning in an introductory biology class. BioScience 52(3),272 -281. Goodwin, L., J.E. Miller, and R.D. Cheetham. (1991). Teaching freshman to think—does active learning work? Bioscience 41 (10): 719–22. Fjørtoft, I., & Sageie, J. (2000). The natural environment as a playground for children: Landscape description and analysis of a natural landscape. Landscape & Urban Planning, 48(1/2), 83–97. Leiberman, G. & Hoody, Linda (1998). Closing the achievement gap: Using the environment as an integrated context for learning. Paper presented at State Education and Environmental Roundtable, San Diego, CA. Woodhouse, J. L, & Knapp, C. E. (2000). Place-based curriculum and instruction: Outdoor and environmental education approaches (ERIC Digest). Charleston, WV: ERIC Clearinghouse for Rural Education and Small Schools. (ERIC Document Reproduction Services No. ED 448 012). Hungerford, H. R., & Volk, T. (1990). Changing learner behavior through environmental education. Journal of Environmental Education, 21(3), 8–21. Sarkar, S., & Frazier, R. (2008). Place-based investigations and authentic inquiry. Science Teacher, 75(2), 29–33. Smith, G. A. (2002). Going local. Educational Leadership, 60(1), 30–33. Sobel, D. (2004). Place-based education: Connecting classrooms and communities. Nature Literacy Series Vol. 4. New Patriotism Series 4. Great Barrington, MA: The Orion Society.